We are now in November and I don’t know if I should start out with good things or not so good things that happened in our Port. I will start out with the good things. 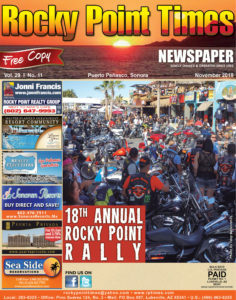 We are having the 18th Annual Rocky Point Bike Rally this month and the hotels, condos, houses are packed. Every year we keep getting more and more bikers and visitors. The OCV is saying we can be expecting about 8,000 bikes, but I honestly think it’s way more than that. 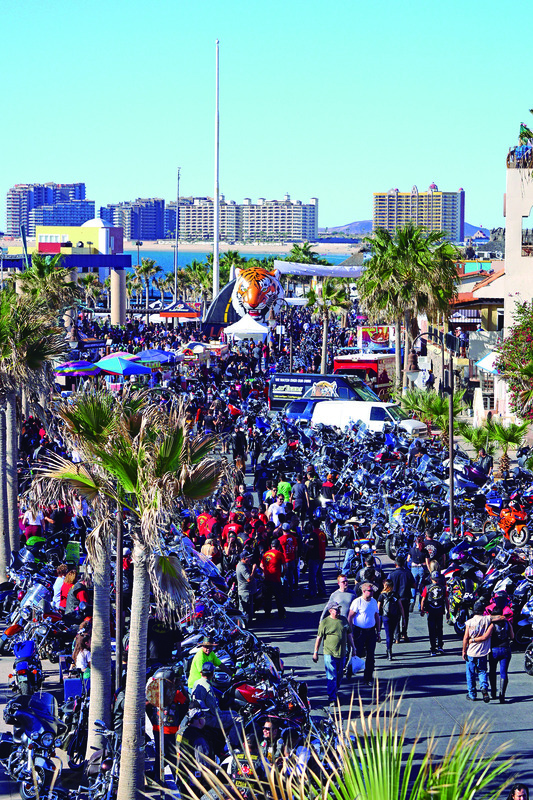 I have shaken hands with bikers from all over Mexico, the U.S., and even Canada. The town is ready for our Rally visitors as is every shop and big and little hotel, taco and hot dog stand. The event starts on the 8th and will kick off with the traditional parade which starts on Blvd. 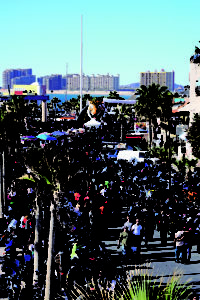 Fremont, then heads off to the Malecon for the mega event, show, raffles, food, music, drinks…lots of drinks! Calle 13 gets pretty wild at night with lots of people and closed off streets (for everyone’s safety), so prepare yourself for a weekend of much awaited fun. And, as always, a big THANK YOU to Oscar Palacio who is the main organizer of this event. Moving on to not so good news, the tropical storm Rosa and then Sergio, left a lot of water and destruction. I don’t think I’ve seen so much rain in our city. It was pretty devastating in some areas and I think everyone had some sort of clean up to do. One of the most affected areas was Brisas Del Golfo, right in the area where Alicia and I live, but we were lucky enough to not suffer any major damages. However many houses were in the sunken areas and did get water inside of up to a meter, or around 3 feet. One of the houses that got lots of water was a well-known friend, Nacho Nachito, who you might know him from playing his Congas at the Lighthouse back in the day and recently at Colin’s Cantina. The worst part was that he was out of town visiting some family in California and when he came back he found his home underwater. Thankfully he just suffered some material loss, but for others such simple material loss may represent everything a family has so I would like to remind you to continue to donate to such organizations as DIF and Red Cross and any others you choose as they continue to help families and people in need. Everyone here was happy to see the sun come out and start drying off their furniture and whatever they could save. I know I said this before, but again, I have never seen so much rain and standing water in Peñasco. We were hammered with continuous hours of rain and we got about 4” of rain in 1-½ days – some reported 6” of rain. It’s just too much rain for our town that gets about 3-½ “ of rain per year – in a good year! The city did a great job setting up the shelters and helping out stranded vehicles. Shelters were set up at the Fire Station and the Red Cross, and I would like to also give them a big THANK YOU for all of their help and all of the support to our community. I would also like to thank our Mayor Kiko Munro for personally getting out there and helping out along with the authorities. The fire station took in complete families because they had nowhere else to go. We are lucky and happy to say that we did not suffer any loss of life and everyone was able to return home and clean up and start over after the storm. And just to let you know, like every winter, we take in blankets and winter clothes and give them to anyone that needs them. Continuing with the storm, the highway down to Caborca was not passable, so roads to Playa Encanto, Miramar, and Mayan Palace were not accessible and people had to be taken in town by pangas or 4×4 vehicles. If you are a Social Media user you probably saw many photos and videos on Facebook – especially of Playa Encanto after Rosa and Cholla Bay after Sergio. Playa Encanto people had to be rescued out of that community since the road was completely washed out and impassable. (I have heard that measures will be taken to redo the Playa Encanto road so its residents will not be stranded in the future.) So why so much water? Well, since the Sonoyta river was running pretty strong it destroyed most dirt roads and the washes were running pretty strong. And along with this, the dam on the Tohono O’odham Reservation had to be opened so it would not break so all of this water came down through the Sonoyta River into Peñasco, looking for a way out to the sea – right into the Playa Encanto area. We have friends that live out there and it was a bit chaotic for them. All of this teaches us that we need to be better prepared and it teaches us that you never know with Mother Nature. During Sergio, Alicia and I were at my family’s reunion down by Caborca and we got rained on, big time, and when we went to come back home, the storm had washed out the Caborca Highway (back up to Peñasco) so we had to go all the way in to Caborca and then up to Sonoyta on Highway 2 and then back down to Highway 8 to get home to Peñasco. The extra drive was worth a weekend with almost 100 of my relatives! We tried to stay updated with during the storms and posted any important information for locals and travelers to help them stay safe, but it was pretty crazy and we are very happy that everything turned out okay. We did suffer some major roof leaks in the office and a lot of our old pictures have been destroyed, but the office is back to normal now – until it rains again (LOL) Obviously the city desperately needs some infrastructure and rain drains since it looks like bad storms are not going away anytime soon. I did notice that during the storms, businesses in Ajo and the Why Travel Store were very good about updating their Facebook Pages to let travelers know the road conditions coming down so a big THANK YOU to them. We would like to wish everyone a Happy Thanksgiving and we hope you have lots to be thankful for this year. Don’t forget to check your favorite restaurants for turkey dinner if you don’t feel like cooking! In years past we have been allowed to bring 1 turkey across the border, but just to let you know that you can get whole turkey’s locally so there’s no need to haul yours down if you don’t want to. As always, email us or hit us up on Facebook if you have any questions. 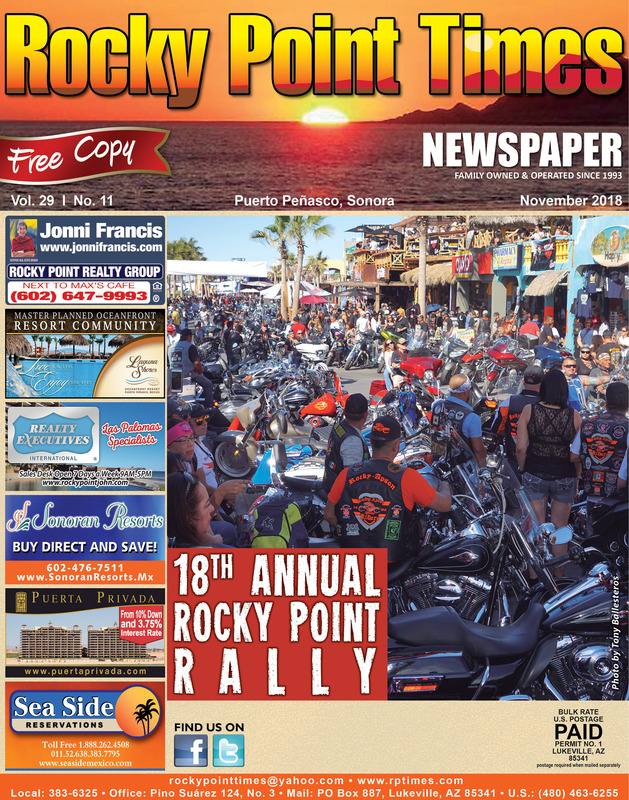 Have a super time at the Rally – I’ll be in Old Port taking photos!